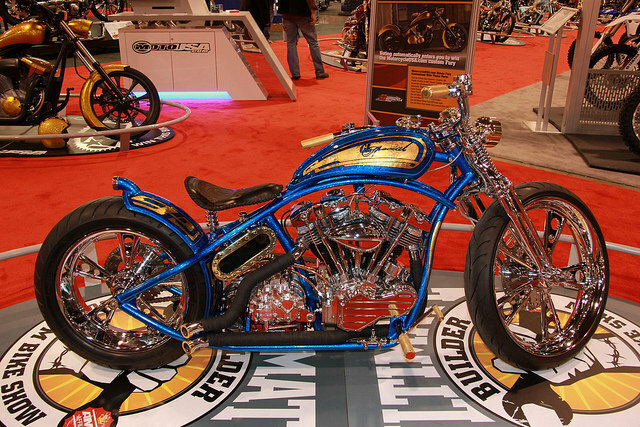 Steve Broyles of Stevenson's Cycle booked his place at the 2012 AMD World Championship and took home a $3000 cash prize by winning the Freestyle class at the Ultimate Builder show in Novi, MI. Steve's 2008 World Championship 9th-placed bike "GL Special" features an S&S 93ci engine with fully polished split rocker boxes and cooling fins. The fins required 3 months of work to complete. Broyles used his signature glass side oil tank that is built like a wedge, brass foot and hand controls. The frame is a custom fabricated rigid bobber unit. The GL Special also sports an Evil Engineering LSD belt drive. Runner-up was Eric Gorges of Voodoo Choppers with "De Lux", and Rob Gallo of Detroit Choppers was third with "Detroit Black Out", a 2011 Road Glide. 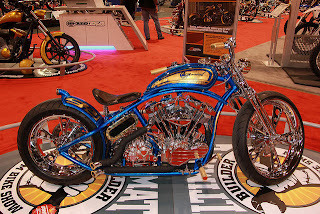 The Modified Harley-Davidson class was won by Chop Doc's Choppers with "Shoobdville", a 1997 Fat Boy Bagger. Jack McCoy of M43 Powersports won Performance Custom with "Inferno", a 2008 Suzuki B-King, and the Retro Mod class was won by Steve Hollon of Golgotha Performance Cycles with "General Grunge", a 1987 Sportster. The Ultimate Builder series now moves to Washington DC on January 13-15, followed by Nerw York on January 20-22. Entries are welcomed at ultimatebuilderbikeshow.com or call Biker Pros on 919-886-5075 for details. Cash prizes are awarded to class winners who also receive a free entry and automatic place at the 9th annual AMD World Championship of Custom Bike Building in Sturgis, August 5-8 2012.